Today was a PERFECT day. If a preschool teacher hit the jackpot, today would be it ! Let me tell you about my day.. so exciting! We are still talking about transportation and we made these trains this morning in small group . We put all the letter of our name in order. The kids love these. I have them hanging on the wall right now, but they will go home soon! Last night Randy and I were at Pinnacle and went to Borders. The WORSE place for me and my checkbook to be is a bookstore. So… I came home with new goodies for the table today. The boys love the books that have wheels. The girls loved the new set of 4 small wooden puzzles in a box. Another choice on the table today was a book to use blocks to make a pattern. We have permission in the paperwork that we sign at the beginning of the year to take spontaneous field trips . This is the BEST part of family child care. We are small enough to appreciate where we are and decide what is best for the kids ” that day.” I have wanted to walk to the train tracks for two days but it was a bit cold . This morning we decided today was the day! 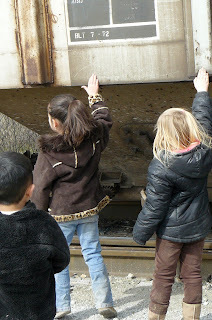 After circle time and reading books about trains, we bundled up and off we went. Walks are great. It gives us a chance to reinforce safety. We also find many interesting things on our walk – shapes- numbers- people and animals. So…. here we go walking past the hospital headed to the train tracks. We are about two blocks away and we hear a train horn. OH NO! We start walking as quickly as we can…. We can see it.. but not up close! Oh PLEASE Mr Train, make our day and slow down so we get to see you! Can you see the train in the distance? We missed it. We sat on the train tracks. We played on the train tracks. We balanced on the train tracks. They went very slow and waved to us! Then they stopped at the rail road crossing. And came back by on the tracks closest to us. It was SO AWESOME! They unhooked the engine and went down to pick up more train cars. The cars had numbers and letters on them. We counted the cars as they passed by us. This is how they hook to each other ! And then… the driver even got off and talk to us. He told us they were carrying corn to the Decatur and corn syrup to the LITTLE DEBBIE plant. We like Little Debbie’s ! Mr. Randy asked him how he knew which cars to pick up and he showed him a list ! He said they go about 40 miles per hour through Siloam. He even let us ask questions! And then we got to touch it! After lunch we drew in our journals about our exciting day! What do I need to pack when I travel? love Audrey's pics, im guessing that's our house, looks just like it! 🙂 video was great!!!! looks like they all had a little bit of energy! Great little project. Thanks for sharing! I'll probably organize something like that in my classroom.